In the spirit of all those buying up half-price Easter candy, let's talk about Goofy's Candy Company. ME: Do you want me to pick up any sour gummy worms? Why all the excitement over a pretty ubiquitous candy? WELL. No doubt over the course of your many WDW trips you've seen walls full of offerings from Goofy's Candy Company. Jelly beans, chocolates, various types of regular and sour gummy candies, all of which look like fairly everyday sweets in colorful Disney packaging. We've tried an assortment of Goofy's offerings, and for the most part you are right. But if you've never tried the sour gummy worms, you are MISSING. OUT. What is it that makes them so superior to all other gummy worm brands out in the world? We're not sure! Perhaps it's the texture, which is firm enough to satisfy but soft enough to readily yield to teeth. Perhaps it's the sour powder coating, just the right level of tart. And there is of course the argument that perhaps it's the fact that you're eating them in WDW, except that we've hauled many bags home and they're just as good there, too. Don't sell Goofy short! Pat and I stumbled upon the worms during our January 2015 trip, and found that they were not as plentiful around the parks as one might otherwise assume. Then, upon my next return trip, I couldn't find any bags around the parks OR resorts AT ALL. So when they popped back up during my next marathon weekend, I brought three bags home. Since then they've been much easier to find, but we still have a sort of knee-jerk reaction to that wall full of Goofy candy: BUY THE LOT! 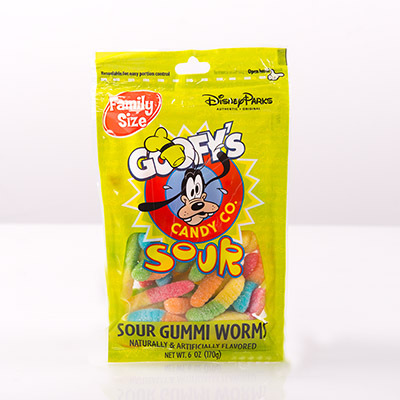 I haven't tried nearly as much out of Goofy's Candy Company as I would like to, but so long as he keeps cranking out the sour gummy worms, we'll keep buying 'em - and hoarding bags at home until we can come back for more. What's your favorite item out of Goofy's Candy Kitchen? Have you tried the sour gummy worms? I've never tried these, thinking the same as you, that they were normal candy in fancy Disney packaging. I'll have to give them a try! I haven't been wowed by any of the other offerings, but the worms are #1!